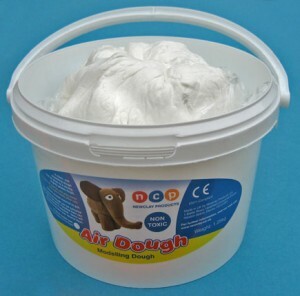 Fantastic big tub of White Airdough – what could be better? All tubs filled in excess of 1.25kg of pristine white airdough ready for modeling or simply playing with. 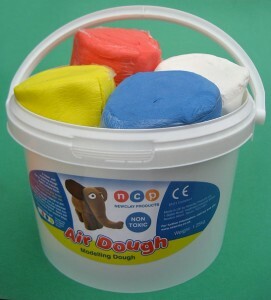 Remember to reseal after opening as airdough dries when exposed to air. Delivery £5.99 (£4.99 + VAT). For more information on multiple tub purchase postal costs please visit our Delivery Page. Brilliant Big Tub including four colours; Red, Blue, Yellow and White. Having the three primary colours means you can mix any other colour you wish and then by adding in white you can vary the shade of each of those colours. Check out the Projects page to see our Colour Wheel Project which is a great practical exercise to teach children how colours are made from the primary colours. 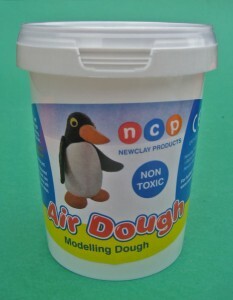 An excellent sized pot of Air Dough for those just wanting to see what it’s like. Believe us when we say you won’t be disappointed and you’ll be back for more! Delivery £2.99 (£2.49 + VAT). For more information on multiple tub purchase postal costs please visit our Delivery Page.